Above: 1978 Dodge Lil Red Express Truck, photo from Dodge factory brochure. 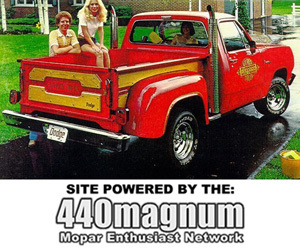 The Dodgelilredexpress.com site is part of the 440magnum Mopar Enthusiast Network. Our extensive network of online properties and resources are focused on mopar enthusiast related topics including trucks. Over the years Ma-Mopar has built many cool trucks including the Lil Red Express Pickup. Others include the Dodge Dakota R/T, Dodge Dude, Dodge Indy Ram Dodge Power Wagon, Dodge Ram Daytona, Dodge Dodge Ramcharger, Dodge Ram SS/T, Dodge Ram SRT-10, Dodge Rumble Bee, Plymouth Trailduster, RAM R/T, Dodge Warlock and many more. This section includes a list of resources devoted to Mopar related trucks. Dodge Lil Red Express Truck Directory at Mopar Search – Lil Red Express resources. Dodge Lil Red Express Truck Directory – 440’S Dodge Li’l Red Express Truck Directory! A comprehensive list of Links to personal web sites strictly devoted to the Dodge Li’l Red Express Truck. Dodge Lil Red Express Version 1.0 Screensaver – A free screensaver featuring a collection of 28 Li’l Red Express Truck’s from past Mopar Shows. Dodge Lil Red Express Version 2.0 Screensaver – A free screensaver featuring a collection of 27 Li’l Red Express Truck’s from past Mopar Shows. Dodge Li’l Red Express Truck Wallpaper – Collection of free Dodge Li’l Red Express desktop wallpapers. Available in both standard and HD sizes. Dodge Dakota R/T Zone – Dedicated to the limited-edition Dodge Dakota R/T pick-up. Photos, Information and more. Dodge Ram Charger Resources – Dedicated to Dodge Ramcharger owners and enthusiasts. Own a Dodge Ramcharger 4×2 or 4×4? Get it featured on our site. Dodge Ram Daytona Resources – Dedicated to Dodge Ram Daytona owners and enthusiasts. Site features Information, Links, Pictures and more. Dodge Ram Rumble Bee Resources – Dedicated to the Dodge Ram Rumble Bee. Site features Information, Links, Pictures and more. My Mopar Truck – Dedicated to Dodge, Plymouth and Mopar related trucks. Plymouth TrailDuster Resources – Dedicated to the Plymouth TrailDuster. Site features Downloads, Information, Links, Pictures and more. Dodge Truck Information – Covers performance and Limited Edition models including Li’l Red Express, Rumble Bee, Dakota R/T, HEMI Sport, SRT-10 and more. Dodge Truck Screensaver Collection – A collection of free screensavers featuring Dodge Trucks. Current collection includes a Dodge A-100, Dodge Dakota, Dodge Li’l Red Express and Dodge Ram Screensavers. Dodge Truck Screensavers – Screensavers featuring classic and modern Dodge Trucks, including Dodge A100, Dodge Dakota, Dodge Dakota R/T, Dodge Ram, Dodge Ram HEMI GTX, Dodge Ram SRT10, Dodge Li’l Red Express and more. Dodge Truck Wallpaper – A collection of Dodge Truck car desktop backgrounds. All Dodge Truck wallpapers can by downloaded very quickly and are completely free.